Not much to report on the game design front again (apologies to those of my readers who are coming here for game design!). I've not played many games this week, just Eclipse (for the second week on the trot) at Games Night. I tried to arrange another Zombology for lunchtime during the week, but yet again couldn't raise a quorum for it. I have had an idea for Zombology though. Ok, that's a little disingenuous. Several of my playtesters have had the same idea, and after months of brushing it off as something that would over-complicate the game, I've finally decided to give it a try. It's all been sparked by The Wife's criticism that she didn't feel like she had any control. When she said it it made me think back to a bunch of other people who had had the same criticism. So I thought about it, and 'I've had' this idea that might help. Zombology is a drafting game, like 7 Wonders, where every turn you play a card from your hand and pass the rest on to the player on your left. I like the fact that the draft gives you some knowledge about what's available in this particular game (since not all the cards are dealt in each game), and it allows you to play cards based on the knowledge of what you've passed to your neighbour. The downside is that if you're dealt a handful of great cards that can't be played yet, you have no choice but to give them to someone else. The idea I've shamelessly stolen from my playtesters is to play a card, and keep a card, from each hand, passing all but one of the remaining cards on. Suddenly there's twice as many decisions to make in the game, which card to play and which one to keep each round. Do you keep the same one over many rounds and play it at the end, or play the kept card and chose a different one to keep next round? Do you keep an event card to prevent another player from playing it, or keep an excellent science card for the end game? Notice something about the last item on each list? The change is an incredibly minor one, just a couple of new lines in the rule book, no card changes or new artwork required. But I fear it will drastically change the dynamic of the game, making it far easier to win and unbalancing all the strategies I've spent nearly a year balancing to a fine point. Once I've tried it a few times I should know whether I need to go back to the drawing board again, re-building the decks from the ground up to fix the balance again. Of course, it might not even help with the control aspect, so at least I don't need to make any changes to try it out. In other news, this week's free time has mostly been spent making a board game app for my phone. I make a trip or two a month to Manchester with my boss (usually) on the train. That's six hours that's often spent playing games on my iPad. I'm making an app for my phone for a simple game that I can't get on the iPad. It's not something that I'm going to publish, seeing as I don't have the license to do it, but it'll be fun for my own enjoyment and I'm learning new stuff as I make it. It's already playable if you know the rules, but it doesn't restrict you at all, so it's very easy to make illegal moves. That's the next step - make it force you to play by the rules! Not much progress this week on Games Design, because I've been focussing my efforts in the digital realm. Last weekend we got a new PC, replacing our knackered old laptop (I think it ran on Windows 1885) with something a bit more modern. It came with Windows 8.1, which has the added bonus of being able to develop Windows Phone apps on it. I also got my phone back on Monday (with a new motherboard! ), which meant I was in full digital flow again. Early in the week I released a new version of my BGG Last Plays app which fixed a crash found by my mate Mal, tweaked a couple of things in the UI and included games in your collection you'd never played (an oversight - since I don't have any unplayed games I didn't think to check!). That also meant that expansions were included now too (though as before you can hide any games you're not interested in). The rest of the week was focused on developing a recording app I'm making for Zombology. Now that Zombology is fairly stable what I need to do is play it a lot of times and see whether the win/loss ratio is where I want it, and check it's consistent across different numbers of players. 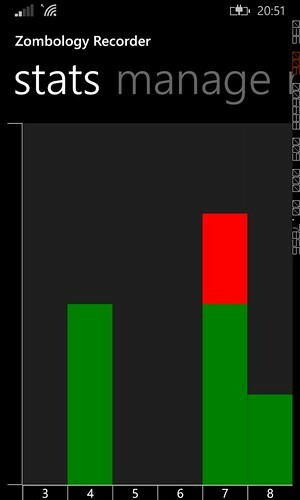 So I've written a little app to record this information and present it graphically for quick reference. It's nearly done, just the graphing of the results to finish off. After that I've a couple more app ideas that I'd like to knock up, one which is a little project that I doubt I'll be able to make available for license reasons, but it'll be a fun little project and I'll use it, the other is an idea that might actually be saleable! But that's a bigger job, and further off. On the games front, I've not even played Zombology this week, I was unable to form a quorum (of three including myself!) for a lunchtime game during the week and at Games Night we just played Eclipse (another one ticked off my games to play this year list). However, The Wife played Zombology last week and found it a little too random for her tastes, she said she didn't feel like she had enough control. I'm fine with some of that in a ten minute game, but thinking about it that tallies with a similar criticism from Paul Scott at Newcastle Playtest, so perhaps I need to address it after all. As most of you know, Zombology started life as my attempt to do a NaGa DeMon game. In November last year I set myself the goal of designing a game in a month! Of course, I knew it wouldn't be finished by the end of November, but I wanted to make something playable in that time. I decided on a quick card game as that would be the easiest thing to make. With only a month I wanted something that I could iterate quickly: both the rules and the components, posting new versions of the rules, playtesting the game frequently and incorporating the feedback quickly into new versions that could then be tested too. By the end of the month I'd been through five versions of the rule book and I'd played it sixteen times. And, as a bonus, it kind of worked as a game. But that's not the end of it. In the following ten months I've played it another sixty odd times, there have been another five major updates to the rules and the components have gone from incredibly basic to slightly more polished (with basic art and everything!). The games has morphed from an every-man-for-himself drafting game for 3-10 players to a semi-co-op drafting game for 3-8 players. It's morphed from sensible science to ridiculous science (Vegan Diet as a potential cure for Zombies!?). But at its heart it's still the same game - a quick, silly, science-themed drafting game with some take that and some collective suit building. There's a few publishers that I'm comfortable approaching, though I've no idea whether it's the sort of thing they are interested in. Perhaps that needs to be my first step. On a related note, before I sent my new phone off for repair (the camera stopped working when I upgraded to Windows 8.1), I starting working on another app for my phone. This one is for personal use: it's to record games I've played of Zombology and the win-loss ratios by number of players. Now the game is settling down I need to get a better idea of how well balanced it is. I've also invested in a Windows 8 laptop to replace our archaic, glacially-slow one. This means that I can now do Windows Phone app development at home, rather than just during my lunch breaks. Reavers! Incoming and Heading Straight for Us! Bonus points if you get the title source. Most of this blog post isn't actually about that kind of reaver though, it's about Reivers. With an 'i'. Border Reivers to be precise. 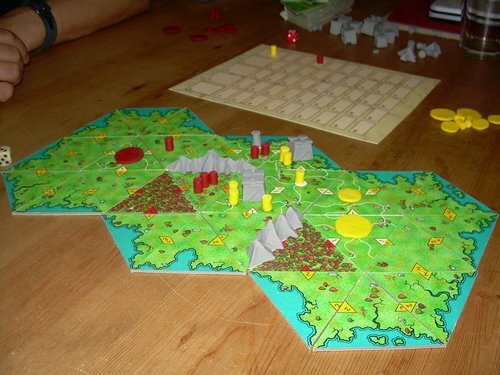 In 2002, after an incredibly long and unsatisfying game of Mighty Empires, I had an idea for a light civilisation/wargame that eventually became Border Reivers. Published in 2006, I made 100 copies by hand and sold them all over the world. It was the first game I designed and the first game I published, and while it obviously holds a special place in my heart, it was one of the weaker games I published, which partly explains why I never reprinted it. Over the years (as this post attests) I've toyed with the idea of doing a second edition, with some changes to fix the reported weaknesses, but nothing ever came of it. After the poor sales of Carpe Astra I lost confidence in my ability to design games and decided that I needed a checkpoint between designer and publication which I could provide for other designers but couldn't for my own designs, since I didn't have the required distance to objectively critique my own games. So Border Reivers II withered and died. Until a month or so ago. As part of my goal to play all my games at least once this year, I played a game of Border Reivers against my boss at the end of one of my Games Nights. He crushed me like the proverbial grape, in part assisted by some lucky reinforcement dice rolls - which relates to one of the criticisms I had received about the game. So that got me thinking about Border Reivers again and, now I'm not looking to self-publish and have the excellent Newcastle Playtest resource available to me, I've decided to brush BR2 off again and see if I can do anything with it. On Tuesday it was the aforementioned Newcastle Playtest so, as well as a new version of Zombology, I took Border Reivers along. There was lots of interest in playing it, but one of the changes I'm keen on is to switch it from 2-4 players to 2 player only, so Paul Scott and I had a game. We played the good old-fashioned rules, and then at the end I asked Paul for ideas on how to improve it, before a lengthy discussion about the criticisms I'd received from players/owners of the first edition. Border Reivers is a light wargame with some civilisation aspects, set on the English-Scottish border during the late middle-ages. It was a time of continual skirmishing along with frequent livestock-rustling (or reiving as it was known). In the game, you start with a city and five armies and have to cultivate your territory, raise armies, build fortifications and settlements as well as going to war, ambushing and reiving your opponent. In the original rules there were two ways to win - either by annihilating your opponents (which only really happened in a 2-player game) or by being the first to accumulate 40 cash. Each turn you got to gamble on reinforcements, either armies or cards that gave you several interesting hidden tactics to assault your opponents. You spent an amount of cash between 0 & 9 and then rolled a D10, if your die roll was less than or equal to your spend, you got a reinforcement. Lots of people really didn't like this and, in fairness, lucky dice rolls early on could really swing the game. One of the ideas I've had is to keep this mechanism, but take away the chance of a free reinforcement and reduce the variability - i.e. roll a die with fewer sides. I'm also considering replacing the cash victory condition with a victory points one, where you get victory points for a variety of things throughout the game. I'll need to try some of these ideas out over the next few months and see which of them stick. Mal, I'm assuming you're up for a game? Back to the title, after the crazy success of my BoardGameGeek collection Windows Phone app (now up to 9 downloads, that's got to be almost everyone who owns one, right?) I've now published my Firefly: The Game app too. This one is designed to streamline the Full Burn movement action in the Firefly board game by reducing the number of 'move a piece, draw a card' cycles you have to go through. It's called Keep Flyin' and is available in the Windows Phone Store now. Finally, we played a couple of seven-player games of Zombology at Newcastle Playtest on Tuesday. The new version has another card type removed, more of the new style art and a few informational changes requested by testers. It went pretty well and on the train on Wednesday down to Sheffield for my quarterly MS check up I made some more cosmetic changes to the cards. This is feeling pretty finished now, so I ought to step up my efforts to contact some publishers. But not in the way the you might think. On Friday I submitted my first app to the Windows Phone Store. It was accepted within the hour and was available to download two or three hours after that. A twitter, BoardGameGeek and Google+ announcement later and it's got 5 downloads! 5! As far as I can tell that means that about 80% of the worldwide Windows Phone ownership have installed my app. How's about that for market penetration? 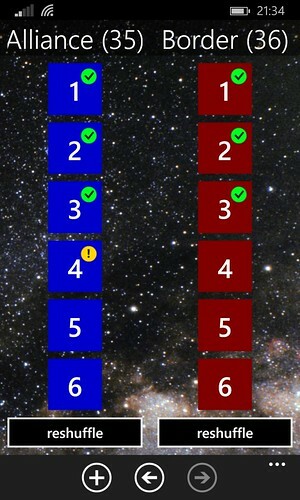 The app, BGG Last Plays, is available for WP8 and 8.1 from the store as we speak. It's a Windows Phone port of the excellent http://lastplays.herokuapp.com, with a couple of improvements that I wanted from the web original: it caches your BGG collection, so you don't need to wait for the download every time and it allows you to set a date, any games that you haven't played since that date are highlighted in the UI and on the live tile. More info is available here. In addition to publishing that at lunchtime, I also finally got the next version of Zombology finished on the computer on Friday night, plus got it printed and cut out. I didn't get it done in time for a potential Playtest session on Thursday, but it is ready for Newcastle Playtest this coming Tuesday. It's been ages since I last made a prototype, it felt good to be crafting something again. Talking of Newcastle Playtest, I'm thinking of taking Border Reivers along with me this week. I've had some ideas for things I could do for a second edition, so it would be good to try those out with the team and get some fresh ideas from them for further improvements. I've also got four hours of train journeys on Wednesday for my quarterly hospital check up that I'm going to spend on the laptop writing blog posts and probably doing some Codename: Vacuum work. After a week of nothing gaming related the week before last, I'm back!